This was such a beautiful episode, I loved it! Definitely exceeded my expectations. So many great scenes to choose from. And I’m guessing most of the fans is gonna pick the “I love you” part, but as sweet as it was, I liked the scene right after it much, much more! The moment when Kate comes to terms with the fact that she’s dying, we can see her entire life’s story. The most important parts. She remembers Cpt. Montgomery’s speech about the dead (probably my favorite one in the entire show!). She thinks about her struggle, her constant efforts to find her mother’s killer, all the death and pain in her life, her loneliness and never feeling safe. And then she remembers the last time when she was very close to death and the person she was thinking about back then: Castle. At this point all the good memories of her time with him, the one she loves the most, mix with the sense of dying, the feeling of fading away. And these happy moments make her stronger, let her accept that she’s almost gone. And that’s where the scene ends. I love flashbacks like this one! So beautiful! Kudos to not only amazing Stana Katic but also people responsible for editing these clips and the composer of the gorgeous melody that we can hear in the scene. It makes this moment perfect. It was absolutely incredible episode, breathtaking and easily one of the best of the entire series. Simple proof can be the fact that pretty much every scene from the episode can be called “Scene of the Week”, even the opening one. Who would have thought the sequence (or maybe lack of it) at the beginning of the episode could be so great? But yes, it definitely was. The moment I’ve chosen as my favorite is the discussion between Root and Finch about the “humanity” of the Machine and its lost memories. First of all, one of the things I love the most about the show is this connection between Harold and his creation. Here, he tells Root just how deep it was, how the Machine actually started to look after him, altering its own code to protect him, starting to act more like human. And what he had to do to stop it, to make the Machine focus on its main goal, which is saving innocent people from the acts of terrorism, for the greater good. And in order to do that, he took away its memories, forcing them Machine to be reborn every single day. What’s truly amazing in the scene is Root’s reaction to Harold’s story. You don’t expect to see someone like her to be so heartbroken about it, to actually stand up for the Machine and decide to fight for it. 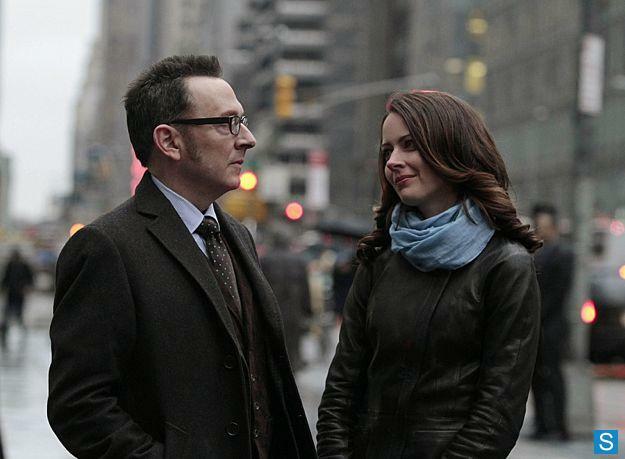 Absolutely remarkable job by Michael Emerson and Amy Acker here, kudos to these two wonderful actors! I’ve already written my review of the episode, so if you read it, you know how much I enjoyed watching this season finale, especially the last 15 minutes, it’s so thrilling and absolutely engaging! My favorite part starts when Philip and Claudia realize that Elizabeth is in danger and he immediately runs to help her. The entire sequence where he tries to get to her on time and the FBI quietly waits to confirm that Elizabeth is the one they’re looking for is brilliantly done. And then Philip arrives and saves his wife from being arrested, and the car chase begins. He’s a really great driver, by the way! I rewatched this scene at least a couple of times and it still keeps me in suspense. Especially knowing that Stan manages to shoot Elizabeth after she gets in the car. Didn’t see this one coming! Can’t wait to see what’s gonna happen in season 2, really glad that in the end the main couple gets back together (“Come home”). I missed them together, they’re much stronger when they work side by side. The Americans 1×12 Promo | “The Oath” [HD] .